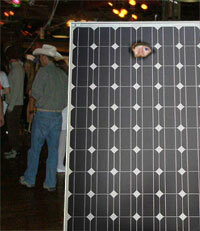 Portland, OR resident, Rick Nation, attends a Halloween party dressed as solar panel. LOS ANGELES, CA – With Halloween right around the corner, costume shops all across the country are stocking up on what are anticipated to be this year’s most popular costumes. The Scoop News talked to several Halloween and costume shop owners about this year’s 10 most popular costumes.